Slot car sets can be fun for the whole family and may make good gifts for either boys or girls, any child who loves cars. Slot car sets have been around for a long time, so they are something that even parents can understand and enjoy. In fact, slot car sets can be nostalgic for adults and draw them into play with the children. Nothing is better than when an entire family can play together. Even if the parents didn’t have this toy as a child, there is little doubt that it is something that most children will love and enjoy greatly. Slot car sets are great fun, and their popularity is a testament of how much kids like playing with them. Plus, they can be played with as a group, so friends and siblings can enjoy it together—or it can be played with alone. If you’re looking for the best slot car race sets in 2017 then our list will help you to find the right one. 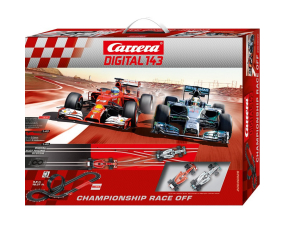 With this slot car track set, you can race Ferraris and Corvettes at home. It features the Chevy Corvette C7.R as well as the Ferrari 458 GT Italia and you can race them against one another. The Corvette is the number one sports car in America whereas the Italian car is hot-blooded. The two cars are closely matched and have set records and won championships. The circuit in this track set extends nearly 12 feet in length and it is ideal for any slot car lover. It has a function piece which ensures there will always be tension in every race. The track set is suitable for those above age six and it is a hobby which requires some degree of skill. Practice ensures better racing. The edges feature fences which help keep the action contained and moving. This slot racing is to a scaled of 1/43, but it provides incredible fun. It comes with a functioning track, lap counter, plug-in power supply, fences, track, 2 hand throttles and 2 cars. Expansion sets are available if you choose to enlarge the track set in the future. It can only be used with Carrera’s “GO” cars. This track can be upgraded easily and it offers outstanding products and a great selection. 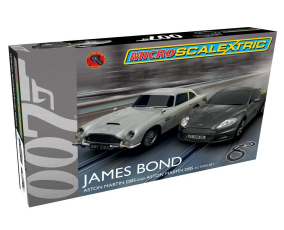 For more than 50 years Scalextric has become a household name and anyone who knows slot car racing has doubtlessly heard of them. Scalextric thinks a lot about the little racers who will be enjoying a slow car race set. The vehicles are made to be incredibly resistant and to endure even the odd tumble. Super strong magnets are in place to reduce the chances that they will come off the circuit particularly on corners. Assembly and packing them up is easy because it is easy to connect and disconnect. The set is also compact. A Flathead screwdriver can be used to adjust the speed located on the controller. It works great for the beginner. You can race two cars next to each other because each car has magnatraction. This lets the car stick to the track so they can go faster. There is an easy change braid plate. The slot car track set lets you expand and also design a variety of different layouts. The track is 1:64 scale any HO scale car will be compatible. This giant 2017 lap counter includes two cars. The controllers are trigger controls which are plugged in. It is tri-power and the dimensions are about 4′ by 8′ but it can be configured to however you would like. It can be extended and other accessories may be added. Most of the receives that this set has have been pretty positive. With light tracing technology you will be able to enjoy the excitement of streaks of light moving across the track as the cars race along. The track itself it also glow-in-the-dark. High-speed racing with the remote control can be brought to the very next level with this track set. There are enough pieces in this set in order to give a challenge to a race of any level or skill. 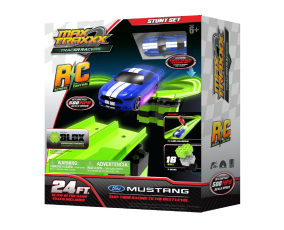 It includes a Mustang racer, lance changer, skill jump, X-BLOX construction brix, and 4 dual corners. The undercarriage lights make the cars look like they are almost hovering above the track. There is a top to-scale speed that reaches an astounding 500 miles per hour. The racings cars can still be driven at different speeds. 4 AA batteries are needed for each individual charger, the controls can be recharged by plugging them in. Advanced or beginning racers will both be able to enjoy this racing track set. A dimly lit room will be perfect for enjoying racing with this particular set. Children can enjoy countless hours of excitement and the combination of fun and discovery together. It includes one R/C Ford Mustang. 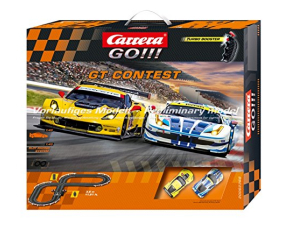 This is one of the top on the list when it comes to finding the best slot car race set. This tracer racer has undercarriage lights which make the cars look like they are floating or hovering instead of actually on the track. As the cars race, they will leave behind glowing streaks. This gives the cars an appearance of “burning” up the track. The can excel at varying speeds and are controlled with a remote. The top to-scale speed which the cars can travel reaches 500 miles per hour. Charging is easy with the battery-powered control. The track set has won awards showing just how outstanding it is. There are 46 ft tracks, all of which glows in the dark. It also includes two R/C race cars, a loop module, sand six corner pieces. 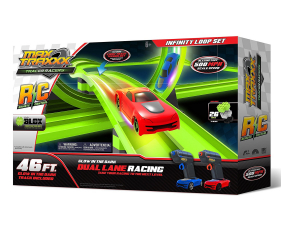 There are 2 remote control tracer racers, more than 46 feet of track that’s all glow-in-the-dark, 6 dual corners that are glow-in-the-dark, and a loop that is also glow-in-the-dark. Customize this racing circuit so and enjoy a head-to-head race. Enjoy a race like you have never experienced before. Each track racer produces purple light rays, and these rays originate from the undercarriage they are engineered specially to emit glow remnants, and that is why there is a streaking effect after each racer passes. To enjoy the full experience of it just play in a room that’s dimly lit. The track length of this race track measures 18,37 feet, and its size is 6.4 by 2.64 feet. The cars included with it are a Ferrari F14 T and a Mercedes-Benz F1 W05 Hybrid. 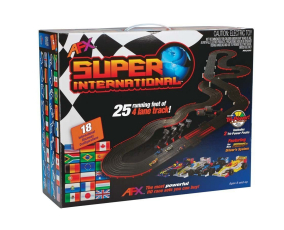 The contents include the supports, guardrails, loop, change section which is a double lane, curves, straights, two speed controllers, connection track, transformer, and of course the cars. The track is in scale 1:43 and you can enjoy the most incredible racing experience. This best electric race car set can support as many as three cars on the track all at once so you can have a genuine race. It offers realistic tactical racing and the potential to overtake and change lanes like you could in a real race. The push of a button lets you overtake or achieve lane-changing at full speed. The speed controller lets you code cars quite easily. It can be used with accessories and action features from Camera Go!!! 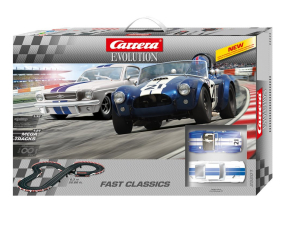 This racing set includes a Ford Mustang, year ’67, and a Shelby Cobra. It is 1:24 scale and it has a track layout that is unique. Enjoy Racing on Mega Tracks for the optimal racing experience. Use cars and tracks from the Digital 124 Series or Carrera Evolution to mix and match. 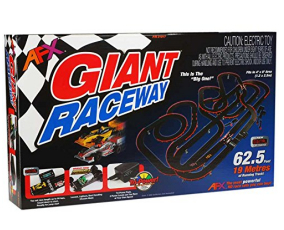 Aside from the two cars, the car racing set includes a transformer, connecting section, supports, guardrails, curves, straights, and two-speed controllers. It is 16 pounds in weight and the dimensions are 5.81” in height, 6.73” in width, and a depth of 20.67.” It can be used by adults or anyone above age 8. From the comfort of your own home, you can experience a real race feeling. This 2017 set comes with four cars. The item weight of this race track is 12 pounds. The product dimensions are 19.4 x 16 x 6.5 inches and it is suggested for those ages 14 and up, so it is more geared for adult use according to the manufacturer. It provides multiple track layouts and an adjustable power supply to make sure the cars don’t fly off the track. The ample options for track layouts are one of the bigger reasons this track has become so popular. The track length of this race set is 32,81/10M. The size of the set is 10.47ft. x 8.27ft and it comes with two Ford Torino Talladega, one of which is “Benny Parson” number 98, and the other of which is “Wendell Scot” number 34. It contains supports, guardrails, curves, straights, two speed controllers, and a connecting section. It can be expanded with additional accessories and track. This electric race car set is in scale 1:24 and the original cars it comes with are in scale 1:32. The track gives you that exciting race thrill all from your own house. It is suitable for individuals eight years old and up. This race set includes a hairpin turn, side swipe track, and also two straight lines of track that are lane change. Altogether this adds up to more than 21 feet of track which gives you plenty of road for racing action. It comes with a Dodge Challenger, Chevrolet Corvette, and an Audi R8. The Corvette has working rear and front lights, and the Audi even has a siren and flashing lights. The slot car set comes with a digital base that is suitable for four cars, but it can be upgraded to as many as six cars if you go with the C7042 Advanced Digital Base. Race as many as four cars simultaneously with this race set. This means that friends and family can join together to race their own cars. There are only 3 cars in the set but you can always add more. Perform maneuvers that are realistic such as braking and overtaking. It is even possible to switch lanes by pressing a single button. Block or overtake your challengers. With this slot car set, you will have all that you need to begin racing. It comes complete with the three cars, each of which has a Digital Chip installed. There are other digital cars which you can get, or else there is the option of converting the majority of standard cars so that they can also function on a digital layout. The Audi R8 Police Car has lights and siren so that you can have it chase the Corvette and Challenger around the track—there are quite a few reasons to love this set and call it the best slot car race set. Slot cars have been part of the family entertainment for several generations and while technologies have brought about many different changes over the years, there is one thing that has never changed, the familiar two grooves (slots) that wind around the full length of the track layout. There has been a number of changes in the track materials, track layouts and even the construction of the cars. All of the changes that have been over the years have created a large number of options available for slot car enthusiasts to choose from. If you are new to the slot car racing set world, we hope that the information that we have provided makes it easier for you to decide which slot car set would be the best for your family. We came up a number of very important things for you to consider when you are looking for your next slot car set. We put together a short list of important things that you should take into consideration when you are looking for the best slot car set. Everything starts with the track and currently there are four major track systems that most of all the slot car sets are based on. 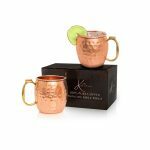 Each one of the four has its own positives and negatives that you will need to look at when you are deciding which one of the many sets that there are available on the market. The four major track systems are Carrera, Ninco, Scalextric Sport and SCX. Carrera – The Carrera style track is near track quality while still being snap-together plastic. The fit of the track very tight and does require a bit of strength to get them together. There are also plastic clips that are designed to hold the track together. 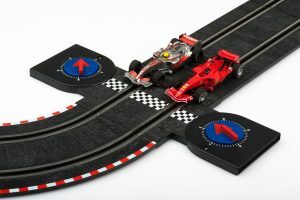 Ninco – The Ninco style track features flexible materials and is 1/2 – inch wider than those of the Scalextric Sport. The extra flexibility in the track means that it will hold up better when it is being assembled and disassembled frequently. 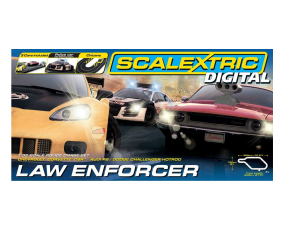 Scalextric Sport – The Scalextric Sport is one of the most versatile of all 1:32 scale slot car track and it can be found in many of today’s slot car set. There is a wide range of track configuration options available using Scalextric Sports track. 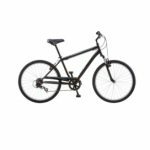 SCX – The SCX style track is basically a resurfaced Scalextric Sports system and it comes in two different types; digital and nondigital. The two types of tracks are absolutely not compatible with each other and cannot be connected together. 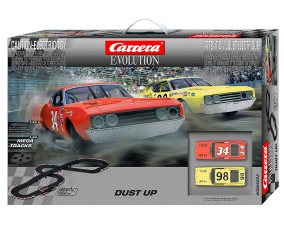 The cars are an important part of today’s slot car sets and there have been major advancements in the design and operation of the cars found in the slot car racing set. The cars you choose should be extremely fast, handle well on the track and can be controlled easily. You also want to look into cars that do not require a whole lot of maintenance in order to keep them running well. When you buying your first slot car set for your kids it is really important that you take into consideration that in order to keep your kids interested you want to be sure that the cars are easy to operate and that they are extremely fun to use. If they are not having fun they are not likely to want to continue. The power being supplied to track is one of the keys to the ability of your cars to go fast on the track together. Having the right amount of power to accomplish this is very important and unfortunately, for safety reasons the government requires the manufacturers of slot car racing sets to limit the power supply amperage. This limitation causes there to be not enough power to run two slot cars at the optimum speed at the same time. While all of the above are extremely important, in the world of slot car racing, it is important to realize that in order to make it much more fun you need to go beyond the basic slot car set. With that in mind, we are adding some recommended extra that you should consider when purchasing your next set. The typical track layouts do not have enough surface in the corners (turns) to allow the car to drift to the side too far without running out of the surface and causing the car to pop out of the slot and stop. To help with this situation, you can easily buy specially designed borders that will give your track layout the needed extra running surface in the corners so that you will not have to worry about it happening. The basic controllers that come with the slot car set are set from the factory at a preset resistance. By design, this creates too much resistance for the cars and tends to cause them to run much slower. Today’s aftermarket controllers dramatically reduce the amount of resistance and will allow the cars to run much faster. These controllers are also repairable, while the typical basic controllers in the racing sets are disposable. Now that you have reached the end of the road, we hope that we provided you with enough information that will allow you to make an informed decision regarding the best slot car set for your money. Slot car sets can provide hours of entertainment for children and adults alike. Racing around cars and competing around a large racetrack can provide copious amounts of fun. Aside from the good times and incredible memories which a slot car set is bound to help to create, it can even bring people together. A race track can bring the adults and children together, or your child and their siblings or friends. Even adults can enjoy it significantly and it is bound to bring up some nostalgic feelings for many parents. These slot car racing’s sets have been in existence for many years and there is little surprise that they have become so popular throughout the generations and among so many countless children and adults. Best Slot car sets can often be extended, meaning that you can add more track, bridges, or other similar accessories to make it longer or more exciting. You can also get more cars to build up a collection of model vehicles that you can swap out racing. There are quite a few possibilities which make owning a slot car set exciting and interesting for anyone. This article will help you to see a selection of top-rated slot car sets with reviews.